The 15th Parliament of Sri Lanka is the current Parliament of Sri Lanka, with the membership determined by the results of the 2015 parliamentary election held on 17 August 2015. The parliament met for the first time on 1 September 2015. According to the Constitution of Sri Lanka the maximum legislative term of the parliament is 5 years from the first meeting. The 15th parliamentary election was held on 17 August 2015. The incumbent United National Party (UNP) led United National Front for Good Governance (UNFGG) won 106 seats, an increase of 46 since the 2010 election, but failed to secure a majority in Parliament. The main opposition United People's Freedom Alliance (UPFA) won 95 seats, a decline of 49. The Tamil National Alliance (TNA), the largest party representing Sri Lankan Tamils, won 16 seats, an increase of two from 2010. The remaining eight seats were won by Janatha Vimukthi Peramuna (6), Sri Lanka Muslim Congress (1) and Eelam People's Democratic Party (1). The new parliament was sworn in on 1 September 2015. Karu Jayasuriya was elected Speaker, Thilanga Sumathipala as the Deputy Speaker and Selvam Adaikalanathan as the Deputy Chairman of Committees. Lakshman Kiriella was appointed Leader of the House and Gayantha Karunathilaka was appointed Chief Government Whip. The Speaker recognised TNA leader R. Sampanthan as Leader of the Opposition on 3 September 2015. JVP leader Anura Kumara Dissanayaka was nominated to be Chief Opposition Whip. The Parliament became a Constitutional Assembly on 9 March 2016 in order to formulate a new constitution for Sri Lanka. Thilanga Sumathipala resigned as Deputy Speaker on 25 May 2018. His replacement Ananda Kumarasiri was elected on 5 June 2018. Following the withdrawal of the UPFA from the national government, Mahinda Rajapaksa and Mahinda Amaraweera were recognised as Leader of the Opposition and Chief Opposition Whip on 18 December 2018. On 20 August 2015 the central committee of the Sri Lanka Freedom Party (SLFP), the main constituent of the UPFA, agreed to form a national government with the UNP for two years. Ranil Wickremesinghe, leader of the UNP, was sworn in as Prime Minister on 21 August 2015. Immediately afterwards a memorandum of understanding to work together in Parliament was signed by acting SLFP general secretary Duminda Dissanayake and UNP general secretary Kabir Hashim. On 3 September Parliament voted by 143 votes (101 UNFGG, 40 UPFA, 1 EPDP, 1 SLMC) to 16 votes (11 UPFA, 5 JVP), with 63 absent (43 UPFA, 16 TNA, 3 UNFGG, 1 JVP), to approve the formation of a national government. Three UNFGG cabinet ministers were sworn in on 24 August 2015. A further 39 cabinet ministers, 28 from the UNFGG and 11 from the UPFA, were sworn in on 4 September 2015. Three more cabinet ministers, one from the UNFGG and two from the UPFA, were sworn in on 9 September 2015. 19 state ministers (11 UNFGG, 8 UPFA) and 21 deputy ministers (11 UNFGG, 10 UPFA) were also sworn in on 9 September 2015. Two more deputy ministers, both from the UPFA, were sworn in on 10 September 2015. A further cabinet minister from the UPFA was sworn in on 23 October 2015. A further cabinet minister from the UNFGG was sworn in on 25 February 2016. A UPFA state minister and two deputy ministers (one UNFGG, one UPFA) were sworn in on 6 April 2016. The UPFA withdrew from the national government on 26 October 2018. President Maithripala Sirisena, leader of the UPFA, dismissed Prime Minister Wickremesinghe and replaced him with former President Mahinda Rajapaksa. The following day Sirisena prorogued Parliament. A constitutional crisis ensued as the UNP refused to accept changes, describing them as unconstitutional, illegal and a coup. Over the next few days Sirisena appointed a new cabinet consisting of MPs from the UPFA, EPDP and defections from the UNP. Despite the defections the UPFA could not muster the support of a majority of MPs and with the TNA, which held the balance of power in Parliament, announcing that it would support a motion of no confidence against Prime Minister Rajapaksa, Sirisena dissolved parliament on 9 November 2018 and called fresh elections for 5 January 2019. The UNP, TNA, JVP and several others challenged the dissolution in the Supreme Court which on 13 November 2018 issued a stay on the dissolution until 7 December 2018. Parliament re-convened on 14 November 2018 when 122 (100 UNFGG, 14 TNA, 6 JVP, 2 UPFA) out of 225 MPs supported the motion of no confidence against Prime Minister Rajapaksa. Sirisena and the UPFA refused to accept the motion of no confidence, saying that Speaker Karu Jayasuriya had not followed parliamentary procedures. On 16 November 2018 parliament passed an amended motion of no confidence against Prime Minister Rajapaksa with the support of 122 MPs. Sirisena rejected the second the motion of no confidence as well, saying that he would not re-appoint Wickremesinghe as prime minister. On 3 December 2018, following a quo warranto petition filed by 122 MPs, the Court of Appeal issued an interim order restraining Rajapaksa and 48 ministers from functioning. On 12 December 2018 117 MPs, including 14 from the TNA, supported a motion of confidence in Wickremesinghe. A seven-bench Supreme Court unanimously ruled on 13 December 2018 that Sirisena's dissolution of parliament on 9 November 2018 was unconstitutional and null, void ab initio and without force or effect in law. The following day a three-bench Supreme Court refused to vacate the Court of Appeal's interim order but allowed for a full appeal to be heard in mid January 2019. Rajapaksa resigned as Prime Minister on 15 December 2018. Wickremesinghe was sworn in as Prime Minister the following day, ending the crisis. The following are the changes in party and alliance affiliations for the 15th parliament. 3 September 2015 - 41 UPFA and 1 SLMC MPs support the formation of a national government. 9 September 2015 - Three UPFA MPs (Indika Bandaranaike, Sumedha G. Jayasena and Lakshman Wasantha Perera) who had abstained from supporting the national government, are appointed deputy ministers. 10 September 2015 - Two UPFA MPs (Anuradha Jayaratne, Dushmantha Mithrapala) who had abstained from supporting the national government, are appointed deputy ministers. 23 October 2015 - UPFA MP Sarath Amunugama is appointed to the cabinet. 6 April 2016 - UPFA MP Lakshman Senewiratne is appointed a state minister. 30 June 2016 - Democratic Party MP Sarath Fonseka joins the UNP. 17 January 2017 - UNFGG MP Athuraliye Rathana Thero announces that he will function as an independent MP. 19 September 2017 - UPFA MP Arundika Fernando crosses over to the opposition. 30 October 2017 - UPFA MP Duleep Wijesekera crosses over to the opposition. 10 December 2017 - MEP MP Sriyani Wijewickrama joins the SLFP. 11 December 2017 - NFF MP Weerakumara Dissanayake joins the SLFP. 28 December 2017 - UPFA MP Nimal Lanza joins the opposition. 15 February 2018 - The Ceylon Workers' Congress pledges support for the president. 8 May 2018 - 16 SLFP MPs, who had voted in favour of the unsuccessful motion of no confidence against Prime Minister Wickremesinghe on 4 April 2018, cross over to the opposition. 26 October 2018 - UPFA withdraws from the national government. 26 October 2018 - Two UNFGG MPs (Wasantha Senanayake and Ananda Aluthgamage) pledge support for new UPFA government. 28 October 2018 - UNFGG MP Vadivel Suresh pledges support for UPFA government. 29 October 2018 - New UPFA government including UNFGG MP Wijeyadasa Rajapakshe and EPDP MP Douglas Devananda is sworn in. 30 October 2018 - UNFGG MP Dunesh Gankanda joins the UPFA government. 2 November 2018 - UNFGG MP S. B. Nawinne and TNA MP S. Viyalendiran join the UPFA government. 4 November 2018 - UNFGG MP Ashoka Priyantha joins the UPFA government. Independent MP Athuraliye Rathana Thero pledges support for the UPFA government. 6 November 2018 - UPFA MP Manusha Nanayakkara resigns from the UPFA government and joins the UNP. 10 November 2018 - Two SLFP MPs (Wimalaweera Dissanayake and Lohan Ratwatte) join the Sri Lanka Podujana Peramuna (SLPP). 11 November 2018 - 34 SLFP MPs[a] and one UNP MP (Ananda Aluthgamage) join the SLPP. 14 November 2018 - Two UPFA MPs (A. H. M. Fowzie and Piyasena Gamage) cross over to the opposition. Wasantha Senanayake and Vadivel Suresh resign from the UPFA government and rejoin the UNFGG. 18 December 2018 - Three UPFA MPs (Indika Bandaranayake, Lakshman Senewiratne and Gamini Vijith Vijithamuni Soysa) cross over to the government. 3 September 2015 - Sarath Chandrasiri Mayadunne (JVP-NAT) resigned. His replacement Bimal Rathnayake (JVP-NAT) was sworn in on 22 September 2015. 15 September 2015 - Chamara Sampath Dassanayake (UPFA-BAD) resigned to become Chief Minister of Uva Province. His replacement Lakshman Senewiratne (UPFA-BAD) was sworn in on 22 September 2015. 19 January 2016 - M. K. A. D. S. Gunawardana (UNFGG-NAT) died. His replacement Sarath Fonseka (UNFGG-NAT) was sworn in on 9 February 2016. 19 January 2016 - A. R. A. Hafeez (UNFGG-NAT) resigned. His replacement M. S. Thowfeek (UNFGG-NAT) was sworn in on 26 January 2016. 2 November 2017 - Supreme Court rules that Geetha Kumarasinghe (UPFA-GAL) is disqualified from being a MP as she holds dual citizenship. Her replacement Piyasena Gamage was sworn in on 10 November 2107. 18 January 2018 - M. H. M. Salman (UNFGG-NAT) resigned. His replacement A. L. M. Nazeer (UNFGG-NAT) was sworn in on 6 February 2018. 23 May 2018 - M. H. M. Navavi (UNFGG-NAT) resigned. His replacement S. M. Mohamed Ismail (UNFGG-NAT) was sworn in on 8 June 2018. Ashoka Abeysinghe KUR 73,184 1 September 2015 UNP UNFGG UNP UNFGG Deputy Minister of Transport (15-18). Lakshman Yapa Abeywardena NAT 1 September 2015 SLFP UPFA SLPP UPFA State Minister of Finance (17-18). State Minister of Public Enterprise Development (17-18). Mahinda Yapa Abeywardena MTR 97,918 1 September 2015 SLFP UPFA SLPP UPFA Minister of Industry and Commerce (18-). Vajira Abeywardena GAL 142,874 1 September 2015 UNP UNFGG UNP UNFGG Minister of Home Affairs (15-18). Selvam Adaikalanathan VAN 26,397 1 September 2015 TELO TNA TELO TNA Deputy Chairman of Committees (15-18). Lasantha Alagiyawanna GAM 57,450 1 September 2015 SLFP UPFA SLFP UPFA Deputy Minister of Megapolis and Western Development (15-17). Deputy Minister of Finance and Mass Media (17-18). J. C. Alawathuwala KUR 106,061 1 September 2015 UNP UNFGG UNP UNFGG Deputy Minister of Home Affairs (18). State Minister of Home Affairs (18). Ameer Ali BAT 16,611 1 September 2015 ACMC UNFGG ACMC UNFGG Deputy Minister of Rural Economic Affairs (15-18). Deputy Minister of Fisheries and Aquatic Resources Development and Rural Economic Affairs (18). Ananda Aluthgamage KAN 56,625 1 September 2015 UNP UNFGG SLPP UPFA Deputy Minister of Tourism and Wild Life (18-). Ranjith Aluwihare MTL 74,785 1 September 2015 UNP UNFGG UNP UNFGG State Minister of Tourism Development and Christian Religious Affairs (18). Wasantha Aluvihare MTL 75,926 1 September 2015 UNP UNFGG UNP UNFGG State Minister of Agriculture (15-18). John Amaratunga GAM 83,070 1 September 2015 UNP UNFGG UNP UNFGG Minister of Tourism Development and Christian Religious Affairs (15-18). Minister of Lands (16-18). Mahinda Amaraweera HAM 84,516 1 September 2015 SLFP UPFA SLFP UPFA Minister of Fisheries and Aquatic Resources Development (15-18). State Minister of Mahaweli Development (17-18). Minister of Agriculture (18, 18-). Chief Opposition Whip (18). Sarath Amunugama NAT 1 September 2015 SLFP UPFA SLFP UPFA Minister of Special Assignment (15-18). Minister of Science, Technology and Research (18). Minister of Skills Development and Vocational Training (18). Minister of Science, Technology, Research, Skills Development, Vocational Training and Kandyan Heritage (18). Minister of Foreign Affairs (18-). Thalatha Atukorale RAT 145,828 1 September 2015 UNP UNFGG UNP UNFGG Minister of Foreign Employment (15-18). Minister of Justice (17-18). Minister of Justice and Prison Reforms (18). Risad Badhiutheen VAN 26,291 1 September 2015 ACMC UNFGG ACMC UNFGG Minister of Industry and Commerce (15-18). Palitha Range Bandara PUT 66,960 1 September 2015 UNP UNFGG UNP UNFGG State Minister of Skills Development and Vocational Training (15-47). State Minister of Irrigation (17-18). State Minister of Irrigation and Water Resources and Disaster Management (18). R. M. Ranjith Madduma Bandara MON 82,316 1 September 2015 UNP UNFGG UNP UNFGG Minister of Public Administration and Management (15-18). Minister of Law and Order (18). Minister of Public Administration, Management, Law and Order (18). Indika Bandaranaike KUR 46,356 1 September 2015 SLFP UPFA SLFP UPFA Deputy Minister of Housing and Construction (15-18). Deputy Minister of Housing and Urban Development (18-). Tharanath Basnayake KUR 43,020 1 September 2015 SLFP UPFA SLPP UPFA Deputy Minister of Telecommunication and Digital Infrastructure (15-18). S. M. Chandrasena ANU 118,234 1 September 2015 SLFP UPFA SLFP UPFA Minister of Plantation Industries (18-). State Minister of Social Empowerment (18-). Chamara Sampath Dassanayake BAD 64,418 1 September 2015 15 September 2015 SLFP UPFA SLFP UPFA Resigned. Replaced by Lakshman Senewiratne. Harsha de Silva COL 114,148 1 September 2015 UNP UNFGG UNP UNFGG Deputy Minister of Foreign Affairs (15-17). Deputy Minister of National Policies and Economic Affairs (17-18). State Minister of National Policies and Economic Affairs (18). Nimal Siripala de Silva BAD 134,406 1 September 2015 SLFP UPFA SLFP UPFA Minister of Transport (15). Minister of Transport and Civil Aviation (15-18, 18-). Douglas Devananda JAF 16,399 1 September 2015 EPDP EPDP UPFA Minister of Resettlement, Rehabilitation, Northern Development and Hindu Religious Affairs (18-). Palani Digambaran NUW 101,528 1 September 2015 NUW UNFGG NUW UNFGG Minister of Hill Country, New Villages, Infrastructure and Community Development (15-18). Anura Kumara Dissanayaka COL 65,966 1 September 2015 JVP JVP Chief Opposition Whip (15-18). Duminda Dissanayake ANU 60,071 1 September 2015 SLFP UPFA SLFP UPFA Minister of Agriculture (15-18). Minister of Irrigation, Water Resources and Disaster Management (18, 18-). Navin Dissanayake NUW 66,716 1 September 2015 UNP UNFGG UNP UNFGG Minister of Plantation Industries (15-18). Weerakumara Dissanayake ANU 69,489 1 September 2015 NFF UPFA SLFP UPFA State Minister of Mahaweli Development (18). S. B. Dissanayake NAT 1 September 2015 SLFP UPFA SLFP UPFA Minister of Social Empowerment and Welfare (15-17). Minister of Social Empowerment, Welfare and Kandyan Heritage (17-18). Minister of Highways and Road Development (18-). Salinda Dissanayake KUR 54,318 1 September 2015 SLFP UPFA SLFP UPFA FState Minister of Indigenous Medicine (18-). T. B. Ekanayake KUR 82,789 1 September 2015 SLFP UPFA SLPP UPFA State Minister of Lands (15-18). Cassim Faizal AMP 61,401 1 September 2015 SLMC UNFGG SLMC UNFGG Deputy Minister of Health, Nutrition and Indigenous Medicine (15-18). Arundika Fernando PUT 47,118 1 September 2015 SLFP UPFA SLPP UPFA Deputy Minister of Tourism Development and Christian Religious Affairs (15-17). Harin Fernando BAD 200,806 1 September 2015 UNP UNFGG UNP UNFGG Minister of Telecommunication and Digital Infrastructure (15-18). Minister of Telecommunication, Digital Infrastructure and Foreign Employment (18). Johnston Fernando KUR 76,714 1 September 2015 SLFP UPFA SLPP UPFA Minister of Trade, Consumer Affairs, Co-operative Development and Christian Religious Affairs (18-). Sudarshani Fernandopulle GAM 73,553 1 September 2015 SLFP UPFA SLPP UPFA State Minister of City Planning and Water Supply (15-18). Sarath Fonseka NAT 9 February 2016 DP UNFGG UNP UNFGG Replaces M. K. A. D. S. Gunawardana. Minister of Regional Development (16-18). Minister of Sustainable Development, Wildlife and Regional Development (18). A. H. M. Fowzie NAT 1 September 2015 SLFP UPFA SLFP UNFGG State Minister of National Integration and Reconciliation (15-18). State Minister of National Unity and Co-existence (18). State Minister of National Unity, Co-existence and Muslim Religious Affairs (18-). Anoma Gamage NAT 1 September 2015 UNP UNFGG UNP UNFGG Deputy Minister of Petroleum and Petroleum Gas Affairs (15). Deputy Minister of Petroleum Resources Development (15-18). Daya Gamage AMP 70,201 1 September 2015 UNP UNFGG UNP UNFGG Minister of Primary Industries (15-18). Minister of Social Welfare and Primary Industries (18). Piyasena Gamage GAL 10 November 2017 SLFP UPFA SLFP UNFGG Replaces Geetha Kumarasinghe. State Minister of Law and Order and Southern Development (17-18). State Minister of Project Management, Youth Affairs and Southern Development (18). State Minister of Youth Affairs, Project Management and Southern Development (18). State Minister of Youth, Women and Child Affairs (18-). Udaya Gammanpila COL 198,818 1 September 2015 PHU UPFA PHU UPFA Minister of Buddha Sasana and Religious Affairs (18-). Mano Ganesan COL 69,064 1 September 2015 DPF UNFGG DPF UNFGG Minister of National Dialogue (15). Minister of National Co-existence, Dialogue and Official Languages (15-18). Minister of National Integration, Reconciliation and Official Languages (18). Dunesh Gankanda RAT 92,804 1 September 2015 UNP UNFGG UNP UPFA Deputy Minister of Disaster Management (15-18). Deputy Minister of Lands and Parliamentary Reforms (18). State Minister of Environment (18-). Mohan Lal Grero COL 65,703 1 September 2015 SLFP UPFA SLFP UPFA State Minister of University Education (15). State Minister of Higher Education (15-18). State Minister of Higher Education and Cultural Affairs (18). State Minister of Education and Higher Education (18-). Edward Gunasekara GAM 65,874 1 September 2015 UNP UNFGG UNP UNFGG Deputy Minister of Internal Affairs and Wayamba Development (18). M. K. A. D. S. Gunawardana NAT 1 September 2015 19 January 2016 DNM UNFGG DNM UNFGG Minister of Lands (15-16). Died. Replaced by Sarath Fonseka. Bandula Gunawardena COL 96,057 1 September 2015 SLFP UPFA SLFP UPFA Minister of International Trade and Investment Promotion (18-). Dinesh Gunawardena COL 124,451 1 September 2015 MEP UPFA MEP UPFA Minister of Megapolis and Western Development (18-). A. R. A. Hafeez NAT 1 September 2015 19 January 2016 SLMC UNFGG SLMC UNFGG Resigned. Replaced by M. S. Thowfeek. Rauff Hakeem KAN 102,186 1 September 2015 SLMC UNFGG SLMC UNFGG Minister of City Planning and Water Supply (15-18). M. H. A. Haleem KAN 111,011 1 September 2015 UNP UNFGG UNP UNFGG Minister of Post, Postal Service and Muslim Affairs (15-18). H. M. M. Harees AMP 59,433 1 September 2015 SLMC UNFGG SLMC UNFGG Deputy Minister of Sports (15-18). Deputy Minister of Public Enterprise and Kandy City Development (18). P. Harrison ANU 113,346 1 September 2015 UNP UNFGG UNP UNFGG Minister of Rural Economy (15-18). Minister of Social Empowerment (18). Kabir Hashim KEG 109,030 1 September 2015 UNP UNFGG UNP UNFGG Minister of Public Enterprise Development (15-18). Minister of Higher Education and Highways (18). Minister of Highways and Road Development(18). M. L. A. M. Hizbullah NAT 1 September 2015 UPFA UPFA State Minister of Rehabilitation and Resettlement (15-18). State Minister of Highways and Road Development (18). Minister of City Planning and Water Supply (18-). State Minister of Highways and Road Development (18-). S. M. Mohamed Ismail NAT 8 June 2018 ACMC UNFGG ACMC UNFGG Replaces M. H. M. Navavi. Nalin Bandara Jayamaha KUR 80,063 1 September 2015 UNP UNFGG UNP UNFGG Deputy Minister of Public Administration and Management and Law and Order (18). Anuradha Jayaratne KAN 93,567 1 September 2015 SLFP UPFA SLFP UPFA Deputy Minister of Mahaweli Development and Environment (15-18). Piyankara Jayaratne PUT 59,352 1 September 2015 SLFP UPFA SLPP UPFA State Minister of Law and Order and Prison Reforms (15-18). Dayasiri Jayasekara KUR 133,832 1 September 2015 SLFP UPFA SLFP UPFA Minister of Sports (15-18). Minister of Skills Development and Vocational Training (18-). Sumedha G. Jayasena MON 69,082 1 September 2015 SLFP UPFA SLFP UPFA Deputy Minister of Sustainable Development and Wildlife (15-18). Chandrani Bandara Jayasinghe ANU 83,666 1 September 2015 UNP UNFGG UNP UNFGG Minister of Women and Child Affairs (15-18). Karu Jayasuriya NAT 1 September 2015 UNP UNFGG UNP UNFGG Speaker (15-18). Lucky Jayawardena KAN 65,461 1 September 2015 UNP UNFGG UNP UNFGG State Minister of Hill Country New Villages, Infrastructure & Community Development (18). State Minister of City Planning and Water Supply (18). Akila Viraj Kariyawasam KUR 286,155 1 September 2015 UNP UNFGG UNP UNFGG Minister of Education (15-18). Ravi Karunanayake COL 111,394 1 September 2015 UNP UNFGG UNP UNFGG Minister of Finance (15-17). Minister of Foreign Affairs (17). Gayantha Karunatileka GAL 149,573 1 September 2015 UNP UNFGG UNP UNFGG Chief Government Whip (15-). Minister of Parliamentary Reforms and Mass Media (15-17). Minister of Lands and Parliamentary Reforms (17-18). Lakshman Kiriella KAN 199,046 1 September 2015 UNP UNFGG UNP UNFGG Leader of the House (15-). Minister of University Education and Highways (15). Minister of Higher Education and Highways (15-18). Minister of Public Enterprises and Kandy Development (18). Minister of Public Enterprise and Kandy City Development (18). Geetha Kumarasinghe GAL 63,955 1 September 2015 2 November 2017 SLFP UPFA SLFP UPFA Disqualified. Replaced by Piyasena Gamage. Nimal Lanza GAM 94,375 1 September 2015 SLFP UPFA SLPP UPFA Deputy Minister of Home Affairs (15-17). Gamini Lokuge COL 58,527 1 September 2015 SLFP UPFA SLPP UPFA Minister of Labour, Foreign Employment and Petroleum Resources Development (18-). Vijayakala Maheswaran JAF 10,263 1 September 2015 UNP UNFGG UNP UNFGG State Minister of Child Affairs (15-18). Ajith Mannapperuma GAM 113,889 1 September 2015 UNP UNFGG UNP UNFGG Deputy Minister of Environment (18). Tilak Marapana NAT 1 September 2015 UNP UNFGG UNP UNFGG Minister of Law and Order and Prison Reforms (15). Minister of Development Assignments (17-18). Minister of Foreign Affairs (17-18). Cader Cader Masthan VAN 7,298 1 September 2015 SLFP UPFA SLFP UPFA Deputy Minister of Resettlement, Rehabilitation and Northern Development (18). Deputy Minister of Resettlement, Rehabilitation and Northern Development (18-). Sarath Chandrasiri Mayadunne NAT 1 September 2015 3 September 2015 JVP JVP Resigned. Replaced by Bimal Rathnayaka. Dushmantha Mithrapala KEG 64,836 1 September 2015 SLFP UPFA SLFP UPFA Deputy Minister of Justice (15-18). Deputy Deputy Minister of Buddha Sasana (15-18). Minister of Justice and Prison Reforms (18). Deputy Minister of Justice and Prison Reforms (18-). Seyed Ali Zahir Moulana BAT 16,385 1 September 2015 SLMC SLMC UNFGG Deputy Minister of National Integration, Reconciliation and Official Languages (18). Faiszer Musthapha NAT 1 September 2015 SLFP UPFA SLFP UPFA Minister of Provincial Councils and Local Government (15-18). Minister of Sports (18). Minister of Provincial Councils, Local Government and Sports (18, 18-). Nishantha Muthuhettigama GAL 75,994 1 September 2015 SLFP UPFA SLFP UPFA Deputy Minister of Ports and Shipping Affairs (15-18). Deputy Minister of Ports and Shipping (18-). Manusha Nanayakkara GAL 73,387 1 September 2015 SLFP UPFA SLFP UNFGG Deputy Minister of Foreign Employment (16-18). Deputy Minister of Telecommunication, Digital Infrastructure and Foreign Employment (18). Deputy Minister of Labour and Foreign Employment (18). Vasudeva Nanayakkara RAT 81,068 1 September 2015 DLF UPFA DLF UPFA Minister of National Integration, Reconciliation, and Official Languages (18-). M. H. M. Navavi NAT 1 September 2015 23 May 2018 ACMC UNFGG ACMC UNFGG Resigned. Replaced by S. M. Mohamed Ismail. S. B. Nawinne KUR 76,714 1 September 2015 UNP UNFGG UNP UPFA Minister of Internal Affairs, Wayamba Development and Cultural Affairs (15-18). Minister of Internal Affairs and Wayamba Development (18). Minister of Cultural Affairs, Internal Affairs and Regional Development (18-). A. L. M. Nazeer NAT February 2018 SLMC UNFGG SLMC UNFGG Replaces M. H. M. Salman. Karu Paranawithana RAT 47,257 1 September 2015 UNP UNFGG UNP UNFGG Deputy Minister of Provincial Councils and Local Government (15-17). Deputy Minister of Skills Development and Vocational Training (17-18). Deputy Minister of Science, Technology, Research, Skills Development and Vocational Training and Kandyan Heritage (18). Buddhika Pathirana MTR 98,815 1 September 2015 UNP UNFGG UNP UNFGG Deputy Minister of Industry and Commerce (18). Ajith Perera KAL 131,383 1 September 2015 UNP UNFGG UNP UNFGG Deputy Minister of Power and Renewable Energy (15-18). State Minister of Power and Renewable Energy (18). Dilan Perera NAT 1 September 2015 SLFP UPFA SLFP UPFA State Minister of Highways (15-18). Gamini Jayawickrama Perera KUR 83,346 1 September 2015 UNP UNFGG UNP UNFGG Minister of Sustainable Development and Wildlife (15-18). Minister of Buddha Sasana (17-18). Lakshman Wasantha Perera MTL 79,309 1 September 2015 SLFP UPFA SLFP UPFA Deputy Minister of Plantation Industries (15-18). State Minister of International Trade and Investment Promotion (18-). Niroshan Perera PUT 59,337 1 September 2015 UNP UNFGG UNP UNFGG State Minister of National Policies and Economic Affairs (15-18). A. D. Champika Premadasa KEG 50,695 1 September 2015 UNP UNFGG UNP UNFGG State Minister of Industry and Commerce Affairs (15-18). State Minister of Plantation Industries (18). Sajith Premadasa HAM 112,645 1 September 2015 UNP UNFGG UNP UNFGG Minister of Housing and Construction (15-18). Susil Premajayantha COL 174,075 1 September 2015 SLFP UPFA SLPP UPFA Minister of Technology, Technical Education and Employment (15). Minister of Science, Technology and Research (15-18). Minister of Public Administration, Home Affairs and Justice (18-). Ashoka Priyantha PUT 35,418 1 September 2015 UNP UNFGG UNP UPFA Deputy Minister of Cultural and Internal Affairs and Regional Development (North Western) (18-). Susantha Punchinilame TRI 19,953 1 September 2015 SLFP UPFA SLPP UPFA Deputy Minister of Public Administration and Management (15-18). Velusami Radhakrishnan NUW 87,375 1 September 2015 UCPF UNFGG UCPF UNFGG State Minister of Education (15-18). Chamal Rajapaksa HAM 80,621 1 September 2015 SLFP UPFA SLFP UPFA Minister of Health, Nutrition and Indigenous Medicine (18-). Mahinda Rajapaksa KUR 423,529 1 September 2015 SLFP UPFA SLPP UPFA Prime Minister (18). Minister of Finance and Economic Affairs (18-).Leader of the Opposition (18). Wijeyadasa Rajapakshe COL 81,758 1 September 2015 UNP UNFGG UNP UPFA Minister of Justice (15-17). Minister of Buddha Sasana (15-17). Minister of Higher Education and Cultural Affairs (18). Minister of Education and Higher Education (18-). Angajan Ramanathan NAT 1 September 2015 SLFP UPFA SLFP UPFA Deputy Minister of Agriculture (18, 18-). Ranjan Ramanayake GAM 216,463 1 September 2015 UNP UNFGG UNP UNFGG Deputy Minister of Social Empowerment and Welfare (15-17). Deputy Minister of Social Empowerment, Welfare and Kandyan Heritage (17-18). Deputy Minister of Social Empowerment (18). Keheliya Rambukwella KAN 65,687 1 September 2015 SLFP UPFA SLFP UPFA State Minister of Mass Media and Digital Infrastructure (18-). Arjuna Ranatunga GAM 165,890 1 September 2015 DNM UNFGG DNM UNFGG Minister of Ports and Shipping (15-17). Minister of Petroleum Resources Development (17-18). Champika Ranawaka COL 100,444 1 September 2015 JHU UNFGG JHU UNFGG Minister of Megapolis and Western Development (15-18). Bimal Rathnayaka NAT 22 September 2015 JVP JVP Replaces Sarath Chandrasiri Mayadunne. C. B. Ratnayake NUW 45,649 1 September 2015 SLFP UPFA SLPP UPFA Minister of Posts and Telecommunications (18-). State Minister of Transport (18-). Sagala Ratnayaka MTR 85,772 1 September 2015 UNP UNFGG UNP UNFGG Minister of Southern Development (15). Minister of Law and Order and Southern Development (15-18). Minister of Project Management, Youth Affairs and Southern Development (18). Minister of Youth Affairs, Project Management and Southern Development (18). M. H. M. Salman NAT 1 September 2015 18 January 2018 SLMC UNFGG SLMC UNFGG Resigned. Replaced by A. L. M. Nazeer. Mahinda Samarasinghe NAT 1 September 2015 SLFP UPFA SLFP UPFA Minister of Skills Development and Vocational Training (15-17). Minister of Ports and Shipping (17-18). Minister of Ports and Shipping (18-). Mangala Samaraweera MTR 96,092 1 September 2015 UNP UNFGG UNP UNFGG Minister of Foreign Affairs (15-17). Minister of Finance and Mass Media (17-18). Ravindra Samaraweera BAD 58,507 1 September 2015 UNP UNFGG UNP UNFGG State Minister of Labour and Trade Union Relations (15-18). Minister of Sustainable Development and Wildlife (18). Minister of Labour and Trade Union Relations (18). Malik Samarawickrama NAT 1 September 2015 UNP UNFGG UNP UNFGG Minister of Development Strategies and International Trade (15-18). Minister of Social Empowerment, Welfare and Kandyan Heritage (18). Minister of Labour, Trade Union Relations and Sabaragamuwa Development (18). R. Sampanthan TRI 33,834 1 September 2015 ITAK TNA ITAK TNA Leader of the Opposition (15-18). Wasantha Senanayake POL 75,651 1 September 2015 UNP UNFGG UNP UNFGG State Minister of Irrigation and Water Resources Management (15-17). State Minister of Foreign Affairs(17-18). Minister of Tourism and Wild Life (18-). Rajitha Senaratne KAL 142,196 1 September 2015 DNM UNFGG DNM UNFGG Minister of Health, Nutrition and Indigenous Medicine (15-18). Sujeewa Senasinghe COL 117,049 1 September 2015 UNP UNFGG UNP UNFGG State Minister of International Trade (15-18). John Senewiratne RAT 90,472 1 September 2015 SLFP UPFA SLPP UPFA Minister of Labour and Trade Union Relations (15-17). Minister of Labour, Trade Union Relations and Sabaragamuwa Development (17-18). Lakshman Senewiratne BAD 42,354 22 September 2015 SLFP UPFA SLFP UPFA Replaces Chamara Sampath Dassanayake. State Minister of Science, Technology and Research (15-18). State Minister of Science, Technology, Research, Skills Development and Vocational Training and Kandyan Heritage (18). State Minister of Defence (18-). Muthu Sivalingam NUW 45,352 1 September 2015 CWC UPFA CWC UPFA Deputy Minister of Primary Industries (18). Deputy Minister of Social Welfare and Primary Industries (18). Ranjith Siyambalapitiya KEG 62,098 1 September 2015 SLFP UPFA SLFP UPFA Minister of Power and Renewable Energy (15-18). Minister of Disaster Management (18). Minister of Power and Renewable Energy (18-). Gamini Vijith Vijithamuni Soysa NAT 1 September 2015 SLFP UPFA SLFP UPFA Minister of Irrigation and Water Resource Management (15-18). Minister of Fisheries, Aquatic Resources Development and Rural Economic Affairs (18, 18-). Thilanga Sumathipala NAT 1 September 2015 SLFP UPFA SLFP UPFA Deputy Speaker & Chairman of Committees (15-18). Vadivel Suresh BAD 52,378 1 September 2015 UNP UNFGG UNP UNFGG State Minister of Plantation Industries (18-). D. M. Swaminathan NAT 1 September 2015 UNP UNFGG UNP UNFGG Minister of Rehabilitation and Resettlement (15). Minister of Rehabilitation, Resettlement and Hindu Religious Affairs (15). Minister of Prison Reforms, Rehabilitation, Resettlement and Hindu Religious Affairs (15-18). Minister of Resettlement, Rehabilitation, Northern Development and Hindu Religious Affairs (18). Palitha Thewarapperuma KAL 118,128 22 September 2015 UNP UNFGG UNP UNFGG Deputy Minister of Internal Affairs, Wayamba Development and Cultural Affairs (16-18). Deputy Minister of Sustainable Development, Wildlife and Regional Development (18). Arumugan Thondaman NUW 61,897 1 September 2015 CWC UPFA CWC UPFA Minister of Hill Country New Villages, Infrastructure and Community Development (18-). M. S. Thowfeek NAT 26 January 2016 SLMC UNFGG SLMC UNFGG Replaces A. R. A. Hafeez. S. Viyalendiran BAT 39,321 1 September 2015 PLOTE TNA PLOTE UPFA Deputy Minister of Regional Development (Eastern Development) (18-). Pavithra Devi Wanniarachchi RAT 87,660 1 September 2015 SLFP UPFA SLFP UPFA State Minister of Petroleum Resources Development (18-). Dilip Wedaarachchi HAM 65,391 1 September 2015 UNP UNFGG UNP UNFGG State Minister of Fisheries and Aquatic Resources Development (15-18). State Minister of Fisheries and Aquatic Resources Development and Rural Economic Affairs (18). Chandima Weerakkody GAL 114,851 1 September 2015 SLFP UPFA SLPP UPFA Minister of Petroleum and Gas (15). Minister of Petroleum Resources Development (15-17). Minister of Skills Development and Vocational Training (17-18). Wimal Weerawansa COL 313,801 1 September 2015 NFF UPFA NFF UPFA Minister of Housing and Social Welfare (18-). Eran Wickremaratne COL 82,738 1 September 2015 UNP UNFGG UNP UNFGG Deputy Minister of Public Enterprise Development (15-17). State Minister of Finance (17-18). Ranil Wickremesinghe COL 500,566 1 September 2015 UNP UNFGG UNP UNFGG Prime Minister (15-18, 18-). Minister of National Policies and Economic Affairs (15-18). Minister of Law and Order (18). Duleep Wijesekera GAM 58,936 1 September 2015 SLFP UPFA SLPP UPFA Deputy Minister of Post, Postal Services and Muslim Religious Affairs (15-17). Ruwan Wijewardene GAM 157,932 1 September 2015 UNP UNFGG UNP UNFGG State Minister of Defence (15-18). Sriyani Wijewickrama AMP 49,691 1 September 2015 MEP UPFA SLFP UPFA State Minister of Provincial Councils and Local Government (17-18). State Minister of Provincial Councils, Local Government and Sports (18, 18-). Anura Priyadharshana Yapa KUR 77,057 1 September 2015 SLFP UPFA SLPP UPFA Minister of Disaster Management (15-18). State Minister of Finance (18-). ^ 1. Rohitha Abeygunawardena; 2. Lakshman Yapa Abeywardena; 3. Mahinda Yapa Abeywardena; 4. Mahindananda Aluthgamage; 5. Indika Anuruddha; 6. Tharanath Basnayake; 7. D. V. Chanaka; 8. T. B. Ekanayake; 9. Arundika Fernando; 10. Johnston Fernando; 11. Sudarshani Fernandopulle; 12. Kanaka Herath; 13. Piyankara Jayaratne; 14. Premalal Jayasekara; 15. Sumedha G. Jayasena; 16. Nimal Lanza; 17. Gamini Lokuge; 18. Sanath Nishantha; 19. Susil Premajayantha; 20. Susantha Punchinilame; 21. Mahinda Rajapaksa; 22. Namal Rajapaksa; 23. Prasanna Ranatunga; 24. Prasanna Ranaweera; 25. C. B. Ratnayake; 26. Shehan Semasinghe; 27. John Senewiratne; 28. Janaka Bandara Tennakoon; 29. Thenuka Vidanagamage; 30. Janaka Wakkumbura; 31. Chandima Weerakkody; 32. Duleep Wijesekera; 33. Kanchana Wijesekera; and 34. Anura Priyadharshana Yapa. ^ "Part I : Section (I) — General Proclamations & C., by the President A PROCLAMATION BY HIS EXCELLENCY THE PRESIDENT OF THE DEMOCRATIC SOCIALIST REPUBLIC OF SRI LANKA" (PDF). The Gazette of the Democratic Socialist Republic of Sri Lanka Extraordinary. 1920/38. 26 June 2015. Archived from the original (PDF) on 2015-09-23. Retrieved 2015-08-21. ^ "Sri Lanka's president dissolves parliament". BBC News. 26 June 2015. ^ Ramakrishnan, T. (26 June 2015). "Sri Lankan Parliament dissolved". The Hindu. ^ "Sri Lanka's President Maithripala Sirisena dissolves parliament". Times of Oman. Agence France-Presse. 26 June 2015. ^ a b c "Bonus seats: UNP 13, UPFA 12". The Daily Mirror. 18 August 2015. ^ "Sri Lanka elections: UNP victory as Rajapaksa faces setback". BBC News. 18 August 2015. ^ Ramakrishnan, T. (18 August 2015). "UNP set to form next government". The Hindu. ^ "Front Row Seat for MR". Ceylon Today. 2 September 2015. p. A2. Archived from the original on 2015-09-23. Retrieved 2015-09-05. ^ "Karu appointed new Speaker". The Daily Mirror. 1 September 2015. ^ "Thilanga appointed Deputy Speaker". Ceylon Today. 1 September 2015. Archived from the original on 2015-09-23. Retrieved 2015-09-05. ^ "Thilanga appointed Deputy Speaker". The Daily Mirror. 1 September 2015. ^ "Gayantha and Kiriella return to office". Ceylon Today. 1 September 2015. Archived from the original on 2015-09-23. Retrieved 2015-09-05. ^ "Sampanthan new opposition leader". The Daily Mirror. 3 September 2015. ^ "R. Sampanthan appointed Opposition Leader". The Nation. 3 September 2015. ^ "JVP leader's name proposed for Chief Opposition Whip". The Sunday Times (Sri Lanka). 3 September 2015. Archived from the original on 2015-10-27. Retrieved 2015-09-12. ^ "Resolution on Constitutional Assembly passed in Parliament". www.adaderana.lk. ^ "Hon. Thilanga Sumathipala resigns from the post of Deputy Speaker". Sri Jayawardenepura Kotte, Sri Lanka: Parliament of Sri Lanka. 30 May 2018. Retrieved 4 November 2018. ^ "Thilanga Sumathipala decides to resign as Deputy Speaker". The Sunday Leader. Colombo, Sri Lanka. Colombo Gazette. 24 May 2018. Retrieved 4 November 2018. ^ Gunasekara, Skandha (6 June 2018). "UNP Ananda Kumarasiri appointed Deputy Speaker". Daily FT. Colombo, Sri Lanka. Retrieved 4 November 2018. ^ Mudalige, Disna; Mallawaarachchi, Amali (6 June 2018). "Ananda Kumarasiri elected Deputy Speaker". Daily News. Colombo, Sri Lanka. Retrieved 4 November 2018. ^ "MR appointed as Opposition Leader". The Daily Mirror. Colombo, Sri Lanka. 18 December 2018. Retrieved 18 December 2018. ^ Irugalbandara, Ramesh (18 December 2018). "Mahinda Rajapaksa named the Opposition Leader". News First. Colombo, Sri Lanka. Retrieved 18 December 2018. ^ Edirisinghe, Dasun (21 August 2015). "SLFP CC for joining national government". The Island. ^ Bandara, Kelum (20 August 2015). "SLFP agrees to join National Govt". The Daily Mirror. ^ Liyanawatte, Dinuka (21 August 2015). "Wickremesinghe sworn in as Sri Lankan prime minister". Reuters. ^ Ramakrishnan, T. (21 August 2015). "Ranil Wickremesinghe sworn in as Sri Lankan Prime Minister". The Hindu. ^ "UNP and SLFP sign MoU". The Daily Mirror. 21 August 2015. ^ "SLFP & UNP sign MoU to form National Govt". Sri Lanka Guardian. 21 August 2015. ^ Hemmathagama, Ashwin (4 September 2015). "Cabinet gets P'ment approval". Daily FT.
^ Indrajith, Saman (4 September 2015). "Parliament approves expansion of Cabinet from 30 to 48". The Island. ^ "Three Cabinet Ministers sworn in". The Nation. 24 August 2015. ^ "New Cabinet". The Daily Mirror. 4 September 2015. ^ "Three more Cabinet ministers appointed". The Daily Mirror. 9 September 2015. ^ "Another defeated SLFPer appointed cabinet minister". The Island. 10 September 2015. ^ a b "New State and Deputy Ministers". The Daily Mirror. 9 September 2015. ^ a b "State and Deputy Ministers take oaths (Updated Full List)". The Nation. 9 September 2015. Archived from the original on 2015-09-10. Retrieved 2015-09-12. ^ a b "Two more Dy. Ministers sworn in". The Daily Mirror. 10 September 2015. ^ a b "Two more Deputy Ministers sworn in". The Nation. 10 September 2015. ^ a b "Dr. Sarath Amunugama sworn in as Minister". Daily News. 24 October 2015. ^ a b Fernando, Tharushan (23 October 2015). "Dr. Amunugama sworn in as Minister for Special Assignments". News First. ^ "SF Regional Development Minister". The Daily Mirror. 25 February 2016. ^ "Field Marshal Sarath Fonseka sworn in as Regional Development Minister". Daily News. 26 February 2016. ^ a b "Two deputy ministers and a state minister appointed". The Daily Mirror. 6 April 2016. ^ a b Jabbar, Zacki (7 April 2016). "Three more ministers". The Island. ^ a b "Sri Lanka president's party quits ruling coalition". Gulf News. Dubai, U.A.E. Agence France-Presse. 27 October 2018. Retrieved 14 November 2018. ^ a b "UPFA withdraws from Govt". The Daily Mirror. Colombo, Sri Lanka. 26 October 2018. Retrieved 14 November 2018. ^ "Sri Lanka in political turmoil after prime minister Wickremesinghe sacked". The Guardian. London, U.K. 27 October 2018. Retrieved 28 October 2018. ^ "Sri Lanka plunges into crisis as President Maithripala Sirisena sacks Prime Minister Ranil Wickremesinghe". The Straits Times. Singapore. Agence France-Presse. 26 October 2018. Retrieved 28 October 2018. ^ "Sri Lanka: Mahinda Rajapaksa, former president, named as PM". BBC News. London, U.K. 26 October 2018. Retrieved 28 October 2018. ^ "Sri Lanka President Maithripala Sirisena sacks Prime Minister, appoints 'strongman' Mahinda Rajapaksa". ABC News. Sydney, Australia. Associated Press. 27 October 2018. Retrieved 28 October 2018. ^ Srinivasan, Meera (27 October 2018). "Sri Lanka political crisis: President Sirisena prorogues parliament as Wickremesinghe seeks session". The Hindu. Chennai, India. Retrieved 14 November 2018. ^ "Sri Lanka president suspends parliament amid political crisis". Al Jazeera. Doha, Qatar. 27 October 2018. Retrieved 14 November 2018. ^ Abi-Habib, Maria; Bastians, Dharisha (26 October 2018). "Sri Lanka Faces Constitutional Crisis as President Unseats Prime Minister". The New York Times. New York, U.S.A. Retrieved 14 November 2018. ^ "Sri Lanka's president sacks PM, sparking constitutional crisis". Special Broadcasting Service (27 October 2018). Sydney, Australia. Agence France-Presse. Retrieved 14 November 2018. ^ Mallawarachi, Bharatha (29 October 2018). "Sri Lanka's president swears in new Cabinet amid deepening political crisis". The Globe and Mail. Toronto, Canada. Associated Press. Retrieved 14 November 2018. ^ Srinivasan, Meera (1 November 2018). "Sri Lanka's new Cabinet expanded". The Hindu. Chennai, India. Retrieved 14 November 2018. ^ "New ministers sworn in". News First. Colombo, Sri Lanka. 9 November 2018. Retrieved 14 November 2018. ^ Rasheed, Zaheena; Kuruwita, Rathindra (9 November 2018). "Sri Lanka president dissolves parliament, sets January snap poll". Al Jazeera. Doha, Qatar. Retrieved 14 November 2018. ^ "Sri Lanka's president calls snap election in bid to end power struggle". The Guardian. London, U.K. Agence France-Presse. 10 November 2018. Retrieved 14 November 2018. ^ "Sri Lanka's President Sirisena moves to dissolve parliament". BBC News. London, U.K. 9 November 2018. Retrieved 14 November 2018. ^ Dwyer, Colin (13 November 2018). "Sri Lankan Supreme Court Blocks President's Bid To Dissolve Parliament". NPR. Washington, D.C., U.S.A. Retrieved 14 November 2018. ^ "Sri Lanka Supreme Court overturns dissolution of parliament". Al Jazeera. Doha, Qatar. 13 November 2018. Retrieved 14 November 2018. ^ Chaudhury, Dipanjan Roy (14 November 2018). "Setback for President Sirisena as Lankan Supreme Court stays his order". The Economic Times. Mumbai, India. Retrieved 14 November 2018. ^ Bastians, Dharisha; Gettleman, Jeffrey (14 November 2018). "Another Twist in Sri Lanka: Parliament Votes Rajapaksa Out". The New York Times. New York, U.S.A. Retrieved 14 November 2018. ^ "Sri Lanka thrown into more turmoil as parliament rejects new Prime Minister Mahinda Rajapaksa". ABC News. Sydney, Australia. Associated Press/Reuters. 14 November 2018. Retrieved 14 November 2018. ^ Indrajith, Saman (15 November 2018). "122 MPs who signed no-confidence motion". The Island. Colombo, Sri Lanka. Retrieved 14 November 2018. ^ "War of words between President and Speaker escalates". Daily FT. Colombo, Sri Lanka. 15 November 2018. Retrieved 16 November 2018. ^ Bandara, Kelum; Perera, Yohan (16 November 2018). "UPFA rejects NCM". The Daily Mirror. Colombo, Sri Lanka. Retrieved 15 November 2018. ^ Kuruwita, Rathindra (16 November 2018). "Chilli paste, books and chairs thrown in Sri Lanka parliament". Al Jazeera. Doha, Qatar. Retrieved 16 November 2018. ^ "Amended no-faith motion against PM and Govt. passed: Speaker". The Daily Mirror. Colombo, Sri Lanka. 16 November 2018. Retrieved 16 November 2018. ^ "Sri Lanka president rejects no-confidence on disputed PM". The New Zealand Herald. Auckland, New Zealand. Associated Press. 17 November 2018. Retrieved 16 November 2018. ^ Aneez, Shihar; Sirilal, Ranga (16 November 2018). "Sri Lanka president rejects Rajapaksa no-confidence vote: lawmaker". Reuters. London, U.K. Retrieved 16 November 2018. ^ Srinivasan, Meera (3 December 2018). "Sri Lanka's Court of Appeal restrains Mahinda Rajapaksa from functioning as PM". The Hindu. Chennai, India. Retrieved 16 December 2018. ^ "Sri Lanka Court Bars Rajapaksa From Office, Disputed PM to Appeal". The New York Times. New York, U.S.A. Reuters. 3 December 2018. Retrieved 16 December 2018. ^ "The Court of Appeal decision: Petition against appointment of PM and ministers:". The Island. Colombo, Sri Lanka. 5 December 2018. Retrieved 16 December 2018. ^ Srinivasan, Meera (12 December 2018). "Ranil Wickremesinghe wins confidence vote". The Hindu. Chennai, India. Retrieved 16 December 2018. ^ Indrajith, Saman (13 December 2018). "TNA throws its weight behind Ranil". The Island. Colombo, Sri Lanka. Retrieved 16 December 2018. ^ "Sri Lanka parliament sacking 'illegal'". BBC News. London, U.K. 13 December 2018. Retrieved 16 December 2018. ^ Sengupta, Ramananda (14 December 2018). "Dissolution of Parliament unconstitutional: Sri Lanka's SC". The New Indian Express. Chennai, India. Retrieved 16 December 2018. ^ "SC. FR Application No. 351/2018" (PDF). Colombo, Sri Lanka: Supreme Court of Sri Lanka. 13 December 2018. Retrieved 16 December 2018. ^ Silva, Shehan Chamika (14 December 2018). "SC refuses to vacate CA's interim order against MR". The Daily Mirror. Colombo, Sri Lanka. Retrieved 16 December 2018. ^ Fernando, Lethonkie (14 December 2018). "Supreme Court refuses to dismiss court of appeal injunction against MR". News First. Colombo, Sri Lanka. Retrieved 16 December 2018. ^ "Rajapaksa: Sri Lanka's disputed PM resigns amid crisis". BBC News. London, U.K. 15 December 2018. Retrieved 16 December 2018. ^ Kuruwita, Rathindra; Rasheed, Zaheena (15 December 2018). "Sri Lanka's disputed Prime Minister Mahinda Rajapaksa resigns". Al Jazeera. Doha, Qatar. Retrieved 16 December 2018. ^ Safi, Michael; Perera, Amantha (16 December 2018). "Sri Lanka: ousted prime minister Wickremesinghe reinstalled". The Guardian. London, U.K. Retrieved 16 December 2018. ^ "Ranil Wickremesinghe is sworn back in as Sri Lanka's Prime Minister after being deposed". ABC News. Sydney, Australia. Associated Press. 16 December 2018. Retrieved 16 December 2018. ^ "Hansard of September 03, 2015" (PDF). Parliament of Sri Lanka. ^ "Athuraliaye Rathana Thero to function as independent candidate". Daily FT. Colombo, Sri Lanka. 17 January 2017. Retrieved 15 November 2018. ^ "JHU's Athuraliye Rathana Thera renounces party affiliation". Daily News. Colombo, Sri Lanka. 16 January 2017. Retrieved 15 November 2018. ^ "Arundika Fernando crosses over to Joint Opposition". Daily News. Colombo, Sri Lanka. 19 September 2017. Retrieved 17 December 2017. ^ Kanakarathna, Thilanka (17 September 2017). "Arundika joins JO". The Daily Mirror. Colombo, Sri Lanka. Retrieved 17 December 2017. ^ "Duleep Wijesekera sits with JO; PM questions move". Daily FT. Colombo, Sri Lanka. 31 October 2017. Retrieved 17 December 2017. ^ "Expelled Deputy Minister crosses over to Opposition". Hiru News. Colombo, Sri Lanka. 30 October 2017. Retrieved 17 December 2017. ^ "JO MP Sriyani to support Maithri". The Daily Mirror. Colombo, Sri Lanka. 10 December 2017. Retrieved 17 December 2017. ^ "JO loses MP to President". The Island. Colombo, Sri Lanka. 11 December 2017. Retrieved 17 December 2017. ^ "Three NFF leaders join SLFP". The Daily Mirror. Colombo, Sri Lanka. 11 December 2017. Retrieved 17 December 2017. ^ "Weerawansa led NFF plunge into deeper crisis: Three NFF leaders join SLFP". Daily News. Colombo, Sri Lanka. 11 December 2017. Retrieved 17 December 2017. ^ "Lanza to support JO". The Daily Mirror. Colombo, Sri Lanka. 28 December 2017. Retrieved 31 December 2017. ^ "Former Deputy Minister Lanza joins the joint opposition". 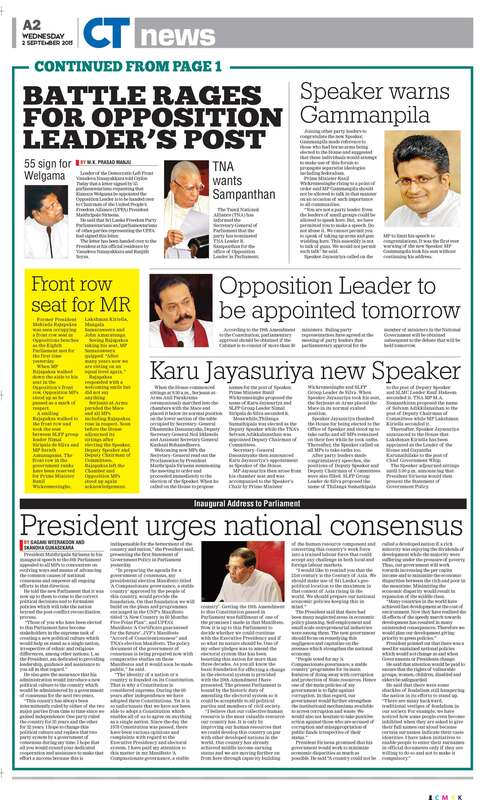 The Sunday Leader/Colombo Gazette. Colombo, Sri Lanka. 28 December 2017. Retrieved 31 December 2017. ^ Bandara, Kelum (15 February 2018). "CWC pledges support to President". The Daily Mirror. Colombo, Sri Lanka. Retrieved 4 November 2018. ^ Kuruluwansa, Asela (16 February 2018). "CWC pledges support to UPFA". Daily News. Colombo, Sri Lanka. Retrieved 4 November 2018. ^ Gunasekara, Skandha (9 May 2018). "16 SLFPers cross over to Opposition". Daily FT. Colombo, Sri Lanka. Retrieved 6 November 2018. ^ Mudalige, Disna; Nathaniel, Camelia; Mallawaarachchi, Amali (9 May 2018). "Sixteen slfp mps cross over". Daily News. Colombo, Sri Lanka. Retrieved 6 November 2018. ^ "Vasantha Senanayake pledges support to MR". The Daily Mirror. Colombo, Sri Lanka. 26 October 2018. Retrieved 15 November 2018. ^ "UNP MP Ananda Aluthgamage joins JO". The Daily Mirror. Colombo, Sri Lanka. 26 October 2018. Retrieved 15 November 2018. ^ "UNP MP Vadivel Suresh pledges support to MR". The Daily Mirror. Colombo, Sri Lanka. 28 October 2018. Retrieved 15 November 2018. ^ "First members of MS-MR cabinet sworn in". Daily FT. Colombo, Sri Lanka. 30 October 2018. Retrieved 31 October 2018. ^ Irugalbandara, Ramesh (29 October 2018). "New ministers sworn in". News First. Colombo, Sri Lanka. Retrieved 31 October 2018. ^ "Dunesh Gankanda appointed State Minister of Environment". The Daily Mirror. Colombo, Sri Lanka. 30 October 2018. Retrieved 31 October 2018. ^ "Dunesh Gankanda - State Minister of Environment". Daily News. Colombo, Sri Lanka. 30 October 2018. Retrieved 31 October 2018. ^ "TNA MP joins govt. with UNP's Nawinne". The Island. Colombo, Sri Lanak. 3 November 2018. Retrieved 2 November 2018. ^ Goonewardene, Devuni (2 November 2018). "New ministers sworn in". News First. Colombo, Sri Lanka. Retrieved 2 November 2018. ^ "Two Cabinet Ministers, a State Minister and a Deputy Minister sworn in". Colombo Page. Indianapolis, U.S.A. 4 November 2018. Retrieved 4 November 2018. ^ "UNP MP Ashoka gets Deputy Minister portfolio". The Daily Mirror. Colombo, Sri Lanka. 4 November 2018. Retrieved 4 November 2018. ^ "Will support President: Rathana Thera". The Daily Mirror. Colombo, Sri Lanka. 4 November 2018. Retrieved 15 November 2018. ^ "Athuraliye Rathana Thero to support the government as an independent MP". Colombo Page. Indianapolis, U.S.A. 4 November 2018. Retrieved 15 November 2018. ^ "Manusha resigns as Dy. Minister". The Daily Mirror. Colombo, Sri Lanka. 6 November 2018. Retrieved 6 November 2018. ^ Kuruwita, Rathindra (7 November 2018). "Manusha quits portfolio goes abroad". The Island. Colombo, Sri Lanka. Retrieved 6 November 2018. ^ "Deputy minister resigns, joins UNP". Tamil Guardian. 6 November 2018. Retrieved 15 November 2018. ^ a b Senarathna, Nuwan (12 November 2018). "MR takes SLPP membership". Daily FT. Colombo, Sri Lanka. Retrieved 16 November 2018. ^ a b Rajakaruna, Charunya (11 November 2018). "Twenty-three SLFP members join SLPP". Ada Derana. Colombo, Sri Lanka. Retrieved 16 November 2018. ^ Perera, Yohan; Bandara, Kelum (14 November 2018). "Fowzie, Piyasena Gamage, Manusha cross over to opposition". The Daily Mirror. Colombo, Sri Lanka. Retrieved 15 November 2018. ^ "Fowzie, Manusha and Piyasena crossover". Ada Derana. Colombo, Sri Lanka. 14 November 2018. Retrieved 15 November 2018. ^ Ferdinando, Shamindra (15 November 2018). "UPFA down to 92 as MS-MR project fails". The Island. Colombo, Sri Lanka. Retrieved 15 November 2018. ^ "Crossed-overs return to UNP, plan to resign from ministerial posts given by President". Colombo Page. Indianapolis, U.S.A. 14 November 2018. Retrieved 15 November 2018. ^ "UPFA MPs Wijayamuni, Lakshman and Indika join govt". The Daily Mirror. Colombo, Sri Lanka. 18 December 2018. Retrieved 18 December 2018. ^ "Three UPFA MPs crossover to govt". Ada Derana. Colombo, Sri Lanka. 18 December 2018. Retrieved 18 December 2018. ^ "JVP MP Mayadunne resigns". The Daily Mirror. 3 September 2015. ^ "Sarath Mayadunne resigns". Ceylon Today. 3 September 2015. ^ a b "Three MPs take oaths today". The Daily Mirror. 22 September 2015. ^ a b "Three new MPs swear in". Ceylon Today. 22 September 2015. ^ "Uva gets a new chief". Ceylon Today. 15 September 2015. Archived from the original on 27 September 2015. ^ "Chamara Sampath Dassanayake new Uva CM". The Nation. 15 September 2015. ^ "Minister M.K.A.D.S Gunawardana passes away". The Nation. 19 January 2016. Archived from the original on 2016-01-23. Retrieved 2016-01-23. ^ "SF takes oaths as a MP". The Daily Mirror. 9 February 2016. ^ "Field Marshal to the parliament". Ceylon Today. 9 February 2016. Archived from the original on 2016-02-16. Retrieved 2016-02-09. ^ "Fonseka takes oath as MP". www.adaderana.lk. ^ Perera, Yohan (19 January 2016). "UNP MP Hafeez resigns". The Daily Mirror. ^ "Thowfeek sworn in as MP". The Daily Mirror. 26 January 2016. ^ "M.S Thowfeek takes oath as MP". Daily News. 26 January 2016. ^ "Supreme Court rules out Parliamentary seat for UPFA MP Geetha". The Sunday Times. Colombo, Sri Lanka. 2 November 2017. Retrieved 17 December 2017. ^ Sooriyagoda, Lakmal (2 November 2017). "Supreme Court rules Geetha unqualified to serve as MP". Daily News. Colombo, Sri Lanka. Retrieved 17 December 2017. ^ "Piyasena Gamage sworn in as Galle district MP". Daily News. Colombo, Sri Lanka. 10 November 2017. Retrieved 17 December 2017. ^ "Piyasena Gamage sworn in to replace Geetha in Parliament". The Sunday Times. Colombo, Sri Lanka. 10 November 2017. Retrieved 17 December 2017. ^ "Part I : Section (I) — General Government Notification Parliamentary Elections Act, No. 1 of 1981 Filling of a Vacancy under Section 64 (2)" (PDF). The Gazette of the Democratic Socialist Republic of Sri Lanka Extraordinary. Colombo, Sri Lanka. 2044/27. 8 November 2017. ^ "UNP MP Salman resigns". Daily News. Colombo, Sri Lanka. 19 January 2018. Retrieved 3 February 2018. ^ "UNP MP Salman resigns". The Daily Mirror. Colombo, Sri Lanka. 18 January 2018. Retrieved 3 February 2018. ^ "Part I : Section (I) — General Government Notification Parliamentary Elections Act, No. 1 of 1981 Filling of a Vacancy under Section 64 (5)" (PDF). The Gazette of the Democratic Socialist Republic of Sri Lanka Extraordinary. Colombo, Sri Lanka. 2056/16. 30 January 2018. ^ "A.L.M Nazeer sworn in as UNP MP". The Daily Mirror. Colombo, Sri Lanka. 6 February 2018. Retrieved 4 November 2018. ^ "New UNP national list MP sworn in". Daily FT. Colombo, Sri Lanka. 7 February 2018. Retrieved 4 November 2018. ^ "ACMC MP Navavi resigns". Daily FT. Colombo, Sri Lanka. 24 May 2018. Retrieved 18 December 2018. ^ Ferdinando, Shamindra (25 May 2018). "Parliament seat reduced to level of lottery prize". The Island. Colombo, Sri Lanka. Retrieved 18 December 2018. ^ "Part I : Section (I) — General Government Notifications Parliamentary Elections Act, No. 1 of 1981 Filling of a Vacancy under Section 64 (5)" (PDF). The Gazette of the Democratic Socialist Republic of Sri Lanka Extraordinary. Colombo, Sri Lanka. 2074/30. 6 June 2018. ^ "Mohamed Ismail fills vacant seat in parliament". News First. Colombo, Sri Lanka. 8 June 2018. Retrieved 18 December 2018. ^ Indrajith, Saman (9 June 2018). "Tainted ex-VC sworn in as new MP – WR". The Island. Colombo, Sri Lanka. Retrieved 18 December 2018. "Part I : Section (I) — General Government Notifications Parliamentary Elections Act, No. 1 OF 1981" (PDF). The Gazette of the Democratic Socialist Republic of Sri Lanka Extraordinary. 1928/03. 19 August 2015. Archived from the original (PDF) on 23 September 2015. "Part I : Section (I) — General Government Notifications Parliamentary Election — 2015 Declaration under Article 99A of the Constitution" (PDF). The Gazette of the Democratic Socialist Republic of Sri Lanka Extraordinary. 1928/25. 21 August 2015. Archived from the original (PDF) on 23 September 2015. "Part I : Section (I) — General Appointments & c., by the President" (PDF). The Gazette of the Democratic Socialist Republic of Sri Lanka Extraordinary. 1929/02. 24 August 2015. Archived from the original (PDF) on 23 September 2015. "Part I : Section (I) — General Government Notifications Parliamentary Election — 2015 Declaration under Article 99A of the Constitution" (PDF). The Gazette of the Democratic Socialist Republic of Sri Lanka Extraordinary. 1929/04. 24 August 2015. Archived from the original (PDF) on 23 September 2015. "Part I : Section (I) — General Appointments & c., by the President" (PDF). The Gazette of the Democratic Socialist Republic of Sri Lanka Extraordinary. 1929/15. 26 August 2015. Archived from the original (PDF) on 23 September 2015. Jayakody, Pradeep (28 August 2015). "The Comparison of Preferential Votes in 2015 & 2010". The Daily Mirror. "Ranil tops with over 500,000 votes in Colombo". The Daily Mirror. 19 August 2015. "Preferential Votes". Daily News. 19 August 2015. Archived from the original on 20 August 2015. "JVP names Handunnetti and Mayadunne through National List". The Nation. 20 August 2015. "UNP national list". The Daily Mirror. 21 August 2015. "TNA names its national List MPs". The Daily Mirror. 24 August 2015.